The UK Turks Add-On offers access to the best streaming content online. You can access sports, live TV and catch-up content with the UK Turks Add-On. Here’s How to install UK Turks Playlist Addon on Kodi. 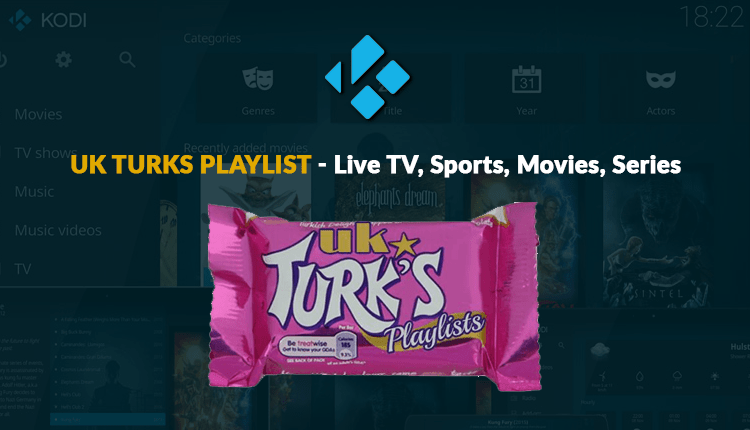 One of the most reliable Kodi add-ons is the UK Turks (UK Turks Playlist) add-on. It is an extension that has withstood the test of time and has been available for Kodi users for a while now in spite of the multiple Kodi versions that have come out in its lifetime. Unlike other add-ons that have a diminishing number of working links coupled with poorer performance over time, UK Turks has actually increased links and improved on performance. An escalating number of subscribers, in fact, has prompted the UK Turks management to move to a new server to handle the demand. UK Turks Playlist gives you access to live and recorded content including live TV, live sports, CCTV, documentaries, movies, cartoons, TV shows, radio and Turkish movies and TV shows. The team behind the add-on, uk_turk, decided to name it after UK and Turkey, the two major audiences for the content although it is also accessible from Australia, U.S. and Canada. UK Turks achieve its robustness from link scraping i.e. collecting other links and putting them in one accessible place. Everything is well categorized into sections e.g. movies, cartoons etc. complete with a section for 1950s movies. UK Turks released an update on January 21st, 2018 with improvements such as a PIN login and new sections. Viewers who stream content from Kodi are strongly advised to have a VPN installed; more so if you want to use third party add-ons like UK Turks Playlists. While Kodi itself is 100% legitmate, some of these add-ons have access to unlicensed content. With the recent changes to net neutrality in late 2017, accessing unlicensed content could have your ISP throttling your connection or you could even get legal notices about copyright infringements. It’s in your best interests to protect yourself and a VPN is the only way to do this. You see, VPNs create a virtual tunnel from your device to the servers that you are accessing. No one is able to penetrate the tunnel that is formed and you can feel comfortable knowing that you are completely secure. But that’s not the only reason for a VPN. Another important point to consider is the issue of georestrictions. This is when certain content is only available if you live in a specific country or region. If that’s the case you can use your VPN to bypass these restrictions by connecting to a server in a country where the content is accessible! IPVanish is the best VPN for Kodi since it hides your IP address and helps you avoid legal trouble like receiving copyright infringement notices. A high-speed connection is another plus that you receive with the IPVanish infrastructure and buffering is avoided since ISPs cannot throttle your connection. Geographical restrictions and censorship are virtually a thing of the past with IPVanish. They have servers in more than 60 countries around the world. Additionally, no logs are stored with IPVanish so your activity can’t be tracked. IPVanish works with a host of different devices and is one of the few VPN solutions to offer installers directly on the Amazon store which makes installation on the Firestick a breeze! Aside from all of these advantages though – I’ve saved the best for last as we’ve negotiated a special deal for all of our readers. Simply click on the link to get 57% off the normal subscription price of IPVanish. Since the UK Turks add-on was down a few weeks back, earlier install procedures don’t work. Fortunately, we’ve found a new installation path for you so simply follow the instructions below to get UKTurks onto your system. First, you have to enable third-party add-ons from Settings; from the Kodi dashboard (Home Screen). Open the ‘gear’ icon on the top left corner to open Kodi settings. Navigate to ‘System Settings’ > ‘Add-ons’ from the system settings menu. Scroll down to “Unknown Sources” and set it to ON. UK Turks has to be located from an online file source. Go back to the Kodi dashboard and open the ‘Settings’ icon again. Once inside, select ‘File Manager’ > ‘Add Source’ which will prompt a pop-up window. Navigate back to the Kodi dashboard and select the ‘Add-ons’ Click the open box icon from the top-left in the ‘Add-ons’ screen. Choose ‘Install from ZIP file’, click on the newly created source (turksaddon) where you will find a ZIP file with the title ‘repository.ukturk-x.x.x.zip’. Open the ZIP file to begin installation after which a notification will appear, informing you that UK Turk Repository has successfully been enabled. For the final step, return to the Kodi home screen, select ‘Add-ons’ and click the open box icon once again. This time, select the ‘Install from Repository’ option and open the ‘UKTurk Addon Repository’ and when inside, click the ‘Video-Addons’ The UK Turks add-on is located in this folder; select the add-on and click on ‘Install’ to finish the procedure. Before you can start using UK Turks you’ll need to get a PIN from another website. It’s actually super easy to do and you can use your mobile to do it so that you don’t even need to leave Kodi. Simply follow the onscreen prompts and you’ll be up and running in less than a minute! You’ll find that the add-on works really easily and the quality of the streams is excellent!